For those who don't know what this achievement is, here is the original achievement. But, with the change to Ulduar which consolidated 10 and 25 man runs into one unit, the achievement was changed. We tried it before Ulduar went to a consolidated raid, but tuning was terrible and we weren't able to last through the second phase. Things just hit the tank too hard. In discussing events we'd like to run, we wondered how Herald of the Titans was doing. Had it been removed from the game with the retooling or was it still available? It's a great fight and requires attention not only to the raid mechanics, but also your character. It's not easy to get. Your officers discussed it and we'd like to run it again, for those people who don't have this achievement and would like it. You will need to level a character to 80 and freeze the XP. Then, you'll need to gear it up. Zylostout has posted to the forum, a guide which discusses everything needed to qualify for the new achievement. Algalon's health and damage has been adjusted. Back in the day, 10-man Ulduar dropped 226 gear. You couldn't wear higher than that. You could, however, have 232 weapons. With the item squish, that's been changed. You can't wear anything higher than item level 100. This goes for jewelry AND trinkets. We will also be needing flasks, gems, and food, when we get to the actual attack. We will be doing an occasional gearing run between now and the end of March, when we are considering running this. I strongly recommend you scroll down to the bottom of the guide and look over the gear, gem, and consumables listing for each class and spec. Note: Some things listed are from Icecrown Citadel. We have opted not to run this on our Legacy toons. The goal was Ulduar, then Onyxia, than Icecrown because gear from Ony has a higher ilevel than ICC gear. We struggled with Ony. It's going to take either breaking the groups in half or a minimum of 18 level 80 toons in order to get her down. 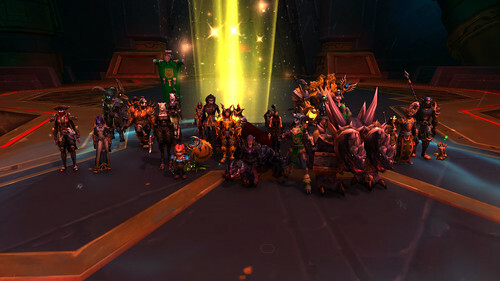 We simply cannot do it with 15 or 16 people in a 25-man raid. For my part, I'm going to forgo any ICC gear because I want to keep Little Gimm as she would have been during that time period. A number of people in the guild have the achievement and have toons which they have kept at that level for just such an occasion. We welcome all guild members to come along. This truly is a mark of achievement for you. If you have any questions, please talk to myself or Tarsan. Oh boy oh boy! Black Temple Timewalking returns February 21st and 22nd. We got as far as Bloodboil the last time. We want to see if we can get farther. This is the perfect time to haul out of storage, all those Legion legendary gear items you got. I'll be running with Thori'dal and if you have the Warglaives of Azzinoth, bring those along. Please make sure whatever gear you bring is gemmed and enchanted as it can be. For some items, particularly, if you are going to run with a set from Burning Crusades, you can enchant way more than you can with Battle for Azeroth gear. Please sign up. We can take at least 25 people into this raid. The more we have, the more dps we can produce and maybe we can get past Bloodboil's blood boil. 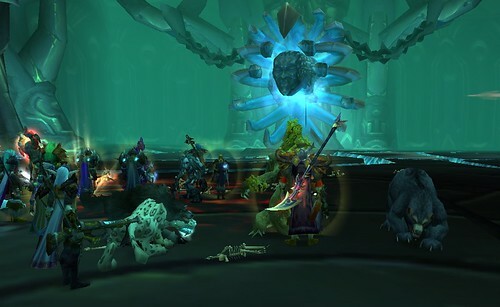 If you've never saw this raid when it was current, Timewalking is as close as you can get. I think the battle above is my favorite. If you have gear questions, you can talk to me, Tarsan, or Mizauki.